Helping Christians apply the Word of God to all | Chalcedon Foundation "Was the United States Founded as a Christian Nation?" 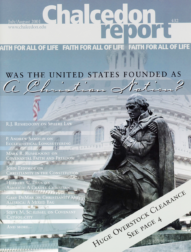 "Was the United States Founded as a Christian Nation?" The idea of sphere law is basic to Christian orthodoxy and to an understanding of Western history. The concept is also termed sphere sovereignty, not an altogether accurate designation, since sovereignty is not ascribed to the spheres but to God and His law. I was pleased when I heard that Chalcedon friends Dennis and Joel Miller (father and son) were starting a new publishing company (Oakdown, www.oakdown.com; P. O. Box 910, Lincoln, CA 95648). A fanciful picture of early Americans as "rugged individualists" is too common in conservative circles. Ostensibly this characterization points out the incompatibility of the early American character with modern socialized thinking. During the twentieth century, various secular writers have asserted that the Framers of the U.S. Constitution were secular-minded men whose goal was to shake off the superstitions of the past (i.e., Christianity) and initiate a new godless era for mankind. In the 1950s, Seton Hall law professor John C. H. Wu wrote in his study on the common law that, while the Roman law was a death-bed convert to Christianity, the American common law was a cradle Christian. And so it was for the two nations as political entities. The Federal Constitution purports to be neutral toward religion. But neutrality toward anything is impossible. At the earliest stages of our nation's formal founding, a number of Christians noticed that a reference to God in the Preamble was absent. Soteriology is that division of systematic theology that covers the Biblical teaching in regard to the salvation of men from their sin and the wrath of God. The heart of soteriology is the gospel of Jesus Christ.